We work on the earliest Coin Operated electro mechanical (EM, Relays,score reels), wood rails to the latest digital DMD electronic (Solid State, SS) pinball games. Pinball Medic also can refurbish and restore both electromechanical (EM) and electronic pinball games. EMERGENCY CODE BLUE REPAIR SERVICE. Use our Contact page to set up an apointment. Information on all other Fees, Charges, Labor Rates and Policies are on our Service page. 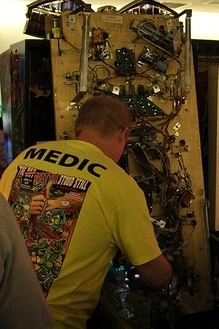 Pinball Medic Cleans and Repairs Coin Operated Pinball Machines. A description of our Pinball Machine Refurbishment / Restoration. Payment Methods: Cash, Money Order, Local Checks, Cashier's Check. No Paypal or Credit Cards accepted. Include the words Code Blue in either the Comments section of the online Repair page or in the Subject line of an E-mail. See our Contact page for other ways to contact us. Our policies and additional fee and warranty information is on our Arcade Game Service page. 'CODE BLUE' Emergency / Priority Pinball Game Repair Field Service. $90 per hour with a one hour minimum - $22.50 per quarter hour after first hour - field service fee. In Shop repair labor rate is $90/hr. Game parts are not included in our labor rates, bids or quotes. E-mails are not considered the same as a signed service contract. They are estimates subject to change. Quoted/Estimated costs in an E-mail can change without notice due to our labor and part costs during a repair or refurbishment depending on the condition of the machine and the availability/costs of replacement parts. Pinball Game Restorations and Refurbishments are now done by Quoted Bids only. Additional work or unforeseen labor time or parts orders will not be done until the game owner signs off on any costs over-runs or bid amendments. Fees &Travel Expenses High gas prices have limited our field service range to central Texas (Austin area). Diagnostic Fee - $35 Charged if the game is not repairable and when game inspection or part removal has occurred. Field Service Fee $100 This fee is usually a one time fee per repair job and covers gas and other expenses. There can be rare situations when this fee is charged again when a long distance has to be travel multiple times to repair/refurbish a pinball within our normal service area. Game Transportation / Long Distance Travel Fee - $100 = Applies if the game is outside our normal service area. Mileage and other fees apply. We cannot deliver a game to any floor except the ground floor. A moving company must be hired to move a game up stairs or to higher levels. Mileage is calculated round trip from our South Austin repair shop. Mileage is in addition to the Field Service or Game Transportation Fees. Commercial and Bulk discounts are available for the repair of multiple pinball machines at the same coin operated arcade room location. If you would like to schedule a service call, please use the Game Repair Request Form or for more information see our Contact page. Most damage to side art and other hard to repair game parts are caused by moving the game. A dolly built to move nothing but a pinball can limit the possibility for game damage and can make moving a 350 pound game quick and painless.